Periods is not "One Which cannot be named"
'Voldemort' in Hogwarts & it's true! Ever heard of an event by a sanitary napkin brand? Especially when talking about such things in public have been considered a taboo. Now! No more. 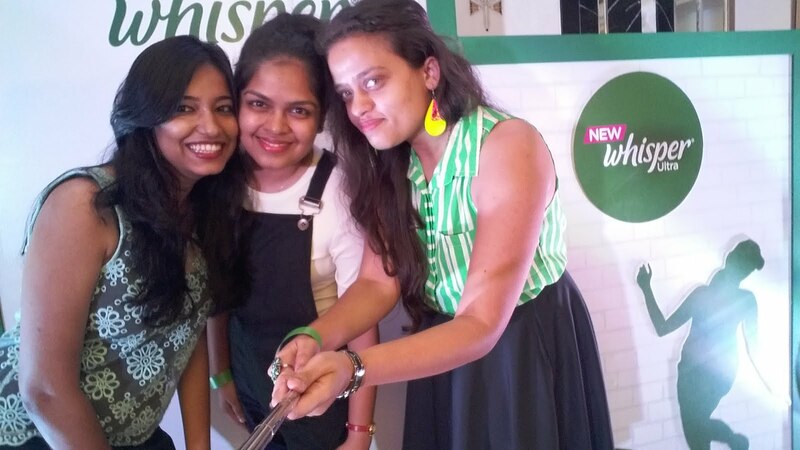 Last month I was invited for the ‘Whisper Out Loud Blogger Hangout’, which was the first exclusive bloggers only preview organized by Whisper India. The event was focused on #OwnThose5Days, “that period of the month” which we usually call it. But why not embrace the fact that it happens, it is all science and not a taboo. In this exclusive preview organised for us, the bloggers, Whisper India, showcased a never seen before innovation via powerful demonstrations highlighting the benefits of the New Whisper Ultra for the women of today who is practically unstoppable, is in every field and it goes without saying that one cannot take her on face value because no matter what she ensures that she delivers to the best of her ability irrespective of the hurdles that come her way, even during those 5 days of the month. The 5 days every month which cumulates to 1500 hours every year is a lot. When she care for everyone, it is one’s duty to care for her and that’s been done by whisper. #OwnThose5Days of the month , Whisper India is launching The New Whisper Ultra - a revolutionary pad that absorb more & lasts longer. Whisper wants to enable women to keep striding forward. In this exclusive bloggers only preview the special guests who came to support were the Versatile bollywood actress Kalki Koechlin, Gynaecologist Dr. Nandita Palshetkar, Whisper R&D Expert Chetan Kotyalkar & stand-up comedian and writer Aditi Mittal, who also unveiled the New Whisper Ultra. Aditi was the MC of the day and totally amazing with her quirky bites and the straight forward comments/opinions. Where Kalki and Aditi kept up the spirit of the event, Dr Nandita and Mr. Chetan took us through the science behind the menstruation, health & hygiene and whisper’s sanitary napkin respectively. Many myths and taboos were pledged to be broken that day like not exercising, not wearing white, not washing hair for the first two days and stay largely at home during periods among others. Post all the technicalities, we were all summoned to participate in amazing fun activities to celebrate the spirit of being unstoppable during periods, the challenge included 5 activities depicting physical hurdles in a fun way. We also left messages in terms of what we pledge to do which are considered taboo #OwnThose5Days, Clicked pictures and had fun. The event ended by yummy food, sweets, lot of confidence, a few pledges to bend the old age rules / taboos and waving good byes. Highlight of the event: According to me it was the demonstration “physics and chemistry behind a whisper pad” by R&D expert Chetan Kotyalkar.